We all know that by talking to our babies we help to encourage their language development leading eventually to those unforgettable first words. The same applies to the other literacy skills of reading and writing. Studies have shown that reading, writing and oral language abilities develop together, beginning at birth and evolving gradually over time. We can encourage this development by actively engaging our children while they are still young in interesting and meaningful reading and writing experiences. By learning preschool literacy skills long before they can actually read or write, our children are more likely to experience later success in reading and writing. Make your child aware of the text around her and help her to interact with it. Expose her to many different types of preschool literacy experiences such as conversation, word play, stories, books, writing materials, road signs, shopping lists etc. You should also let your child see you read every day - whether it is a newspaper, a recipe book or a magazine. This will show her the value and enjoyment of reading and she will begin to learn why, what and how people read. Label the environment. Talk to your child commenting on what she is doing, thinking and seeing. Engage your child in conversations. Ask questions and encourage her to reply. Use interesting new vocabulary when speaking to your child. Tell and draw stories for your child. Take turns describing pictures in books. Try pretending to make a mistake. Children love correcting their parents! Read aloud to your child. The importance of reading aloud cannot be overemphasised for developing preschool literacy skills. Research shows that it is the single most important activity for building the knowledge required for eventual reading success. Find out more about how you can make the most of reading to children. 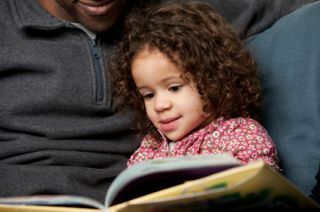 Research shows that children from homes containing many books develop a high interest in books themselves. These children are more likely to develop enhanced preschool literacy skills and ultimately become more confident readers. Create a print-rich environment. Surround your child with books and other written materials. Place baskets full of books around the house where they will be used most often, for example the bathroom, kitchen, playroom and bedroom. Label toy boxes and bedroom doors. Point out the different forms and functions of print. For example, point out signs warning of danger or telling you where to find a favourite restaurant, menus informing you of food choices, lists reminding you what to buy, books telling a story. Explain how books 'work'. They have a front and a back, you read from left to right and top to bottom. Words are made up of letters and there are spaces between words. Try pretending that a stuffed animal wants to read the book and doesn't know how. Can your child help? Where should the animal start? Which word should he read first? Then what? Go to the library. Let your child pick out her own books. Surround your child with writing supplies. Provide a variety of different supplies where they can be easily reached such as paper of different colours, pens, pencils, crayons, chalkboard and chalk, markers and marker board. Encourage your child to write or draw. Provide a bulletin board to display your child's writing and other work. Develop your child's writing skills by trying some of these activities for teaching writing. Read nursery rhymes and rhyming poems. The unusual sounds and rhythms in nursery rhymes captures your child's attention and entertains her. She focuses on the strange rhymes and alliterations rather then the actual meaning of the words. This tunes her ear to differences and similarities in how words sound. For example, to know that 'pat' rhymes with 'cat' but not with 'pack' means that she can distinguish among sounds, thus helping her make the association between written letters and their sounds. This will eventually help her to use known words to read new (rhyming) words. Reinforce the idea of syllables. Clap between the syllables of a nursery rhyme. This will help reinforce the idea of breaking down a word into parts to spell or read it. Build your child's awareness of sounds in words by playing these phonics games. They are all about recognising sounds in words, blending sounds to make words and having fun with rhyming words. Use stamps to help your child learn the letters. Write her name and ask her to reproduce it with alphabet stamps. Provide other material to help your child manipulate letters. For example, magnetic letters on the refrigerator, sponge letters in the bath. 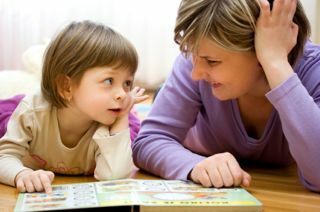 Point out letter-sound connections to your child while reading books. Alphabet books can be particularly useful for this. Try these other early literacy activities to help your child recognise the letters of the alphabet and the sounds which the letters make.